I’ve been reading Kevin Kruse’s book, One Nation Under God, and I’m intrigued by his analysis of how “corporate America invented Christian America.” Oftentimes our national debate circulates around the Founders and how they understood the relationship of church and state. Even with a fairly adequate historical record available to us, Conservatives and Liberals argue ad nauseam about what the authors of our Constitution and Bill of Rights intended. Kruse also downplays the theory that the Christian revival of the 1950’s was primarily a reaction against Communism. Kruse only nods to these discussions and instead posits an economic domestic agenda: that “a Christian America” was intentionally created in the 1930’s by anti-FDR corporate magnates in league with Evangelical preachers. Decades before Dwight Eisenhower and his administration instituted the American civil religion mantras of “one nation under God” and “In God We Trust,” Corporate America and Evangelical Christianity began planning for the wedding of religion and politics—a marriage like none other in the history of our nation. In order to counter the New Deal and its challenge to wealthy industrialists, the National Association of Manufacturers (NAM) recruited willing preachers to help spread the gospel of individual prosperity exemplified in the capitalist system of free enterprise. …Conservative Clergymen used their ministerial authority to argue, quite explicitly, that New Dealers were the ones violating the Ten Commandments. In countless sermons, speeches, and articles…these ministers claimed that the Democratic administration made a “false idol” of the federal government…that it caused Americans to covet what the wealthy possessed and seek to steal it from them…Above all, they insisted that the welfare state was not a means to implement Christ’s teaching about caring for the poor and the needy, but rather a perversion of Christian doctrine. In a forceful rejection of the public service themes of the Social Gospel, they argued that the central tenet of Christianity remained the salvation of the individual (7). To be fair, President Roosevelt was also bold to use biblical arguments and images to further his causes. FDR’s first inaugural speech, Kruse points out, was so laden with references to Scripture that the National Bible Press published an extensive chart linking his text with the Corresponding Biblical Quotations. “In the speech, Roosevelt reassured the nation that ‘the money changers have fled from their high seats in the temple of our civilization. 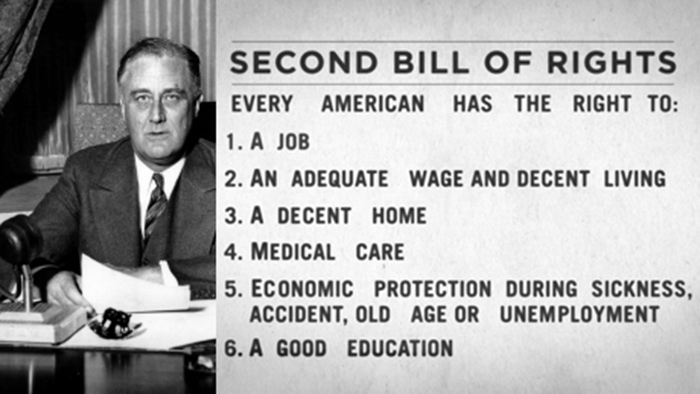 We may now restore the temple to the ancient truths.’” The New Deal itself was grounded in the Social Gospel, a version of Christianity that understood the importance of the public good, of the fundamental significance of “daily bread, shelter and security.” In pulpits across the nation, Liberal preachers championed the New Deal and its welfare state as simply “the Christian thing to do” (5). The same basic divides exist in America today as have always existed between Conservatives and Liberals, between individualists and communitarians. Is the purpose of a corporation to turn a profit and make its investors wealthy or to produce meaningful services and products in a safe and equitable workplace? Is the job of government to protect individual rights or to serve the common good? Is the goal of religion to accomplish individual salvation or to motivate love and service toward the neighbor? Maybe none of this is either/or. Maybe that’s why this whole issue gets so complicated. Kevin Kruse helps us understand what is happening in our current culture and how we got here. 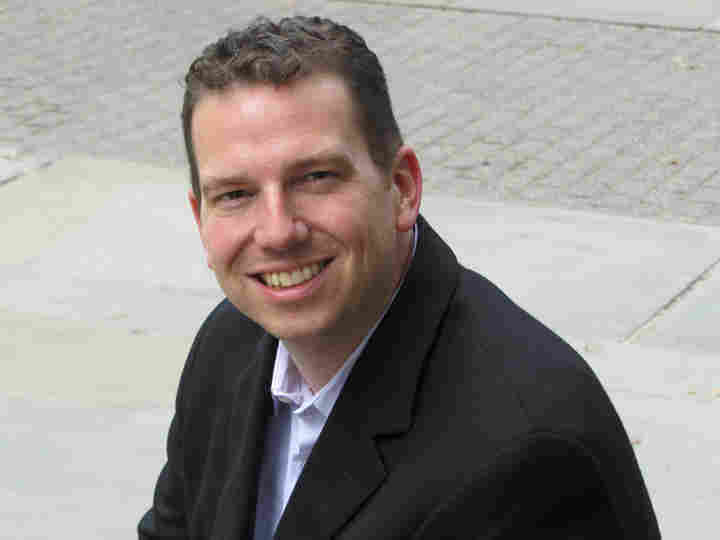 Kevin Kruse adds perspective to the historical evolution of the courtship and marriage of religion/business/and/politics that we are now experiencing and he sheds light on why certain issues have become such battlegrounds. Kruse also reminds us that these developments are recent; much of this invention of a “Christian America” has happened in my lifetime. Kruse knows well the power of religion. Some of my readers wish religion would just go away but that will never happen since religion has been a significant part of the human experience from our earliest beginnings. Religion in and of itself is not the problem; when done right, faith helps people become more aware of self and others and more deeply connected to all creation. But Kruse’s work gives us clarity about how religion continues to be manipulated for personal, corporate and political gain. He helps uncover some of the roots of these ill-advised (not to mention illegal) conflations of church and state and how this approach has gained traction in the last few decades. In my opinion, there are many, honest, well meaning Conservatives who continue to be deceived by con artists who are quite good at manipulating religious passion. Such insight should give us the ability to challenge some of these perversions of religion and change how its power influences our public policies. On March 14, 2015 Kruse published this except from the book in the New York Times: A Christian Nation? Since When? 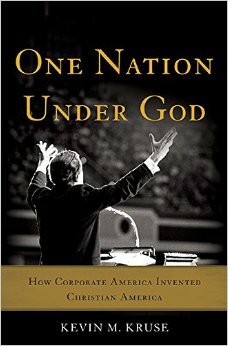 On April 16, Politico presented this thorough piece: How Corporate America Invented the Religious Right. Kevin M. Kruse is a professor of history at Princeton and the author, most recently, of One Nation Under God: How Corporate America Invented Christian America (Basic Books, 2015). “Corporate Jesus” Image credit: “The Senior Partner” by Nathan Greene. Excellent, Charlotte! Thank you for this summary of Mr. Kruse’s work. It reminds me once again that the most basic rule for understanding politics is Follow the Money. I’ve been reading W.E.B. Du Bois’s “The Souls of Black Folk,” published 1903. In it he explains how the slave owners introduced Christianity to the slaves but twisting it to emphasize doctrines of passive submission and patiently enduring suffering, sorrow and all kinds of injustices with hope for the afterlife. All the while the “Christian” slave owners raped their women, beat and killed their people, ripped apart families, exploited them in every way possible, and all kinds of horrendous things. I would propose that Christianity in the U.S. has been shaped and is still shaped by slavery and we’re still reaping the consequences for the distortion of Christianity during that time. 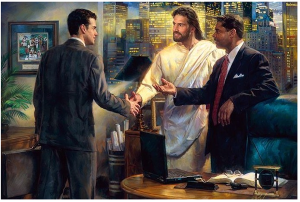 As I see it, the Corporate America/Christian America correlation should also include the Racist America/Christian America correlation. From a white person’s standpoint it’s easy to look for problems within the church without acknowledging the church’s racist past and the consequences for that racism. Another great,thoughtful article…and now a book I will have to read!